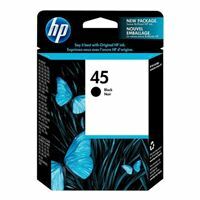 The HP 45 Black Inkjet Print Cartridge is ideal for business or home users who want high-quality, long-lasting printouts. Delivers high print quality using high-density, pigmented ink to produce crisp, sharp characters on most bond/copier papers, and is made to work with HP color inks. The print cartridge contains genuine HP ink that provides quality and reliability every time you print.